Separating one chemical from another may sound incredibly dull, but it's vital to making everything from plastic dishes to cleaning drinking water. Chemical separation accounts for 10 to 15 percent of the nation's energy use. The relatively thick nature and inefficiency of these separation techniques adds to the amount of energy used. Researchers at Pacific Northwest National Laboratory and East China Normal University devised and tested a thin-about as thin as the skin of a soap bubble-film composed of a special type of molecules called peptoids that can repair itself, similar to the self-repair seen in cells of living organisms. Notably, scientists can add distinct chemical and structural patterns into the membranes with near atomic precision. Why It Matters: The team's detailed understanding of how these thin films, inspired by nature, self-repair and adjust to situations moves us closer to creating such films for industry. For example, scientists can use these properties to synthesize membranes that have a high surface area, meaning they can do a lot of work, and with tiny, nanometer-sized, patterns. The results prevent energy-wasting reactions in fuel cells and in water filtration, chemical sensing, and catalytic materials for industry and energy production. Methods: Two-dimensional, sheet-like materials are of increasing interest for use in filtration, sensing, and nanoelectronics because of their unique properties. Peptoids are a class of sequence-specific polymers, whose chemically different components are arranged in an ordered fashion. These polymers can self-assemble into two-dimensional ordered materials that mimic aspects of cell membranes. Synthesized from a combination of modified versions of the amino acid glycine, the new film is flexible, allows greater control over desired interactions through introduction of specific side chains, and is far more thermally and chemically stable than those assembled from natural polypeptides or lipids. However, emulating the functionality of cell membranes requires much more than simply mimicking their structural characteristics. Emulating functionality requires creating multifunctional membranes that can reconfigure to precisely reposition components, co-assemble with other peptoids to introduce new functions, and self-repair. 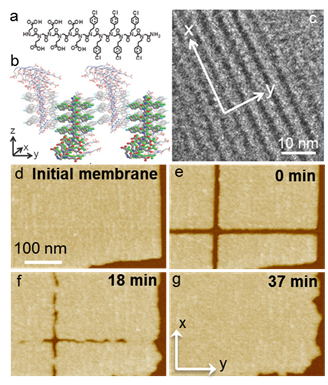 Using in situ atomic force microscopy (AFM), the researchers showed that the peptoid membranes can indeed self-repair and reorganize on negatively and positively charged substrates and even in the absence of an underlying surface. The team "wrote" on the membranes with an AFM probe in water to create a series of peptoid-free linear gaps tens of nanometers in width and several nanometers to micrometers in length. These gaps ran both along and across the peptoid rows. The membrane initiated repair by introducing and assembling peptoid building blocks at the newly created edges. As assembly proceeds, the two exposed edges of the gap advance toward one another until the gap is eliminated. The rate of repair depends on the direction in which the edges grow. The growth can be controlled by varying the number of building blocks added or by changing the solution pH. Repair using peptoid monomers with differing structure and chemistry demonstrated that the lipid-like design of these membranes could essentially be rewritten by inserting patterns of new distinct functional groups into them with nanometer-scale precision to produce multifunctional two-dimensional materials by design. What's Next? This work is part of ongoing materials research at PNNL. Sponsors: Research supported by the U.S. Department of Energy's Office of Science, Basic Energy Sciences (atomic force microscopy studies), the Pacific Northwest National Laboratory Laboratory Directed Research and Development effort (peptoid synthesis), and the China Scholarship Council (FJ). In one sentence: Researchers at Pacific Northwest National Laboratory and East China Normal University devised and tested a thin film composed of a special type of molecules called peptoids that can repair itself, similar to the self-repair seen in cells of living organisms.